There are many commmunity events to take part in! In addition to our internal events, we also participate in externally organized events. Besides the events listed below, we also receive donations collected at events hosted in the City of Leduc and throughout the Leduc County. Our volunteers are usually present at each externally organized event to represent our organization and to help with event tasks. Please check our facebook page regularly for updates on what is happening & how you can get involved. If there is an event you would like to partner with us for, please contact our Executive Director at director@ldfb.ca. Golf at RedTail Landing and Leduc Golf Club, with a dinner banquet and evening program including special entertainment at the Signature Flight Support Hangar at EIA. Volunteers will be collecting donations for the Leduc & District Food Bank. Non-perishable food items can be bagged and left on your doorstep labelled 'Food Bank'. Check with your church or school for additional opportunities to donate during Food Bank Week. Food and monetary donations may also be dropped off at the Food Bank between 9:00 AM and 12:00 PM and 1-4 PM on Mondays, Wednesdays and Fridays. Come out and volunteer! HELP ROUND IT UP! Get a group together and challenge your friends and co-workers. The holiday train visits this community with hundreds of thousands of festive lights and a live show featuring well known performers every 2 years. It is the only fundraiser of its kind for food banks in Canada. Come out and enjoy this worthwhile family event . 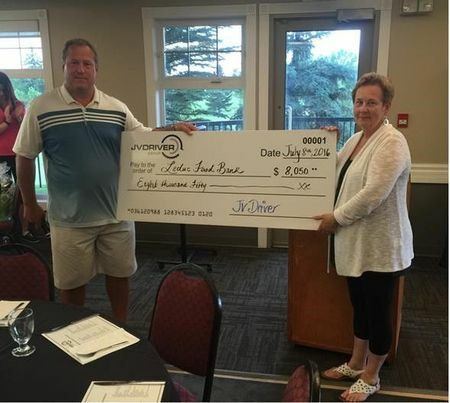 July 2016 - Thank you for the donation of $8050, presented by Doug Malinski during the 2016 JV Driver Golf Tournament. January 2016 - Sobey’s Beaumont Owner Brett Schilling (second from left) donated $20,087 to the Beaumont Nisku Christmas Elves volunteer coordinator Madeline Hubbard, Leduc County FCSS and New Sarepta Christmas Elves coordinator Lucille Erickson (right) and the Leduc & District Food Bank executive director Gert Reynar (third from right). 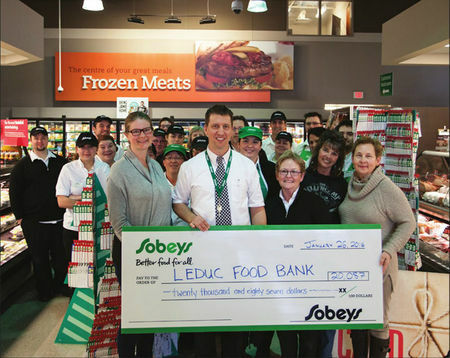 The donation was collected at the tills over the Christmas season, and could not have been done without the help of Sobey’s staff and the generosity of the community, Schilling said. Since 1996, Leduc residents and businesses have woken up on Canada Day with a small but extra reason to be a proud Canada. 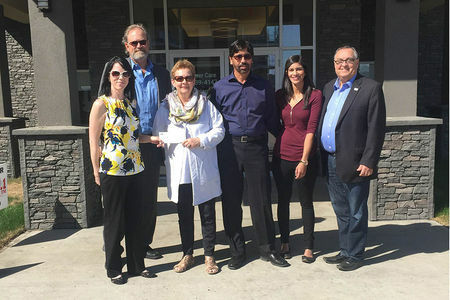 At the May 23rd meeting, David Marriott, a Director of the Leduc Food Bank was on hand to receive personal donations of non-perishable food and household items (totalling 134 pounds) from Optimist members and a $250.00 cash amount from the Club. The Leduc Public Library and 4Cats Arts Studio are joining forces in early October on a creative way to fight hunger in Leduc and area. To mark the Leduc and District Food Bank’s 30th anniversary, the library and art studio are inviting Leduc’s children to contribute to a collaborative collage designed to honour the food bank, teach lessons in thankfulness, and have a good time in the process. To be completed at the library just before Thanksgiving, under the title “Thankful Hearts”, the collage will be an expression of thanks for all the work the food bank does for families in and around the city. “Basically we’re creating a masterpiece of thankfulness on canvas,” said Emily Richard, the library’s youth programs coordinator. From 6-8 p.m. on Thursday, Oct. 9, library staff will help children add their own contribution to the painted collage, using prompts and concepts based around Thanksgiving-related themes. “It’s just a way for the kids to realize that this does happen, and there’s a need for it in the community and [the food bank] has been filling that need for a long time,” Richard said. Participation is open to any child aged 8-12. Registration is available at the library or by calling 780-986-2637. When it’s completed, the 2X3 collage will be donated to the food bank. The painting itself will be complemented by an ongoing food drive. Though the library always accepts dropoffs for the food bank, they’re putting extra emphasis on collection this month, just before the holiday season ramps up.